He points at his chest covered in a black hoodie bearing lurid fluorescent slogans from the motoring world and tells me his name is "Lek". That is what the word sounds like, but he means "Luck". A set of Rosary beads with a large cross at its end dangles down his front. In his 26 years it doesn't seem that Luck has known much of easy times - but maybe that depends on how you look at life. In the early days of April, 1991 the fortunes of Luck's family started shifting when Mount Pinatubo, dormant for 500 years, began to wake up after a series of earthquakes. Half of Luck's family belongs to the Aeta indigenous people who fled the persecution of the Spanish conquistadores centuries earlier. When the Aetas heard the rumblings coming from Pinatubo two decades ago they were amongst the first to abandon their homes and farms and head to the flatlands below. The details of what happened two months later in the middle days of June have been distorted, spouting various figures of destruction, but all agree that it was the second largest volcanic explosion of the 20th Century, the effects of which were felt around the world. Luck remembers his six-year-old-self hearing the thunder-like groans coming down from the mountain. For three days the noise kept coming, louder and uglier, until all that was rolling around deep inside its volcanic belly erupted in three violent bursts spewing ash as high as 34 kilometres (21 miles) into the sky. The lives of 847 people were lost, most of them crushed beneath roofs that couldn't withstand the weight of ash mixed with the mud from typhoon rains, and 20,000 Aetas lost their homes and livelihood. We are skidding and lurching across a vast watery plain of mud in the lowlands of Mount Pinatubo. The tyres of our hired jeep add criss-crosses to the slithered rivulets of slurry. Backlit by the sun, it is deep shimmering charcoal against the blue sky. Luck is stretched out against the bar that hangs off the back of the open jeep. Like other Aetas, he makes a regular life from guiding tourists on a volcano climb. If Luck harbours resentment about what Mount Pinatubo has done to his family, he doesn't show it. The landscape begins to change; the rivulets deepen to streams and rocks. The jeep's suspension mocks our backsides as it bounces us around two ledges lining the sides of its rear tray. Luck just laughs, and we join him. Something under the jeep's hood goes wrong. Luck laughs again, and we join him. The driver fiddles beneath the hood and resurrects the jeep's aging limp. It carries us on until it can go no deeper into streams that now spray through clusters of boulders. We get out. The rest of the volcano climb will be done on foot. Strange, TLTB had expected to see a mountain rising above us. Mount Pinatubo was never big at 1745 metres (5725 feet), and during its latest eruptions it blew more than 300 metres (984 feet) off its top. Instead, we pass through the ashen halls of a deep wide ravine where the Lahar rises above us hundreds of metres either side, sometimes forming spires like some great gothic cathedral. The ground is a lunarscape. Rocks mix with boulders, often more than 1.5 metres (five feet) high. Water snakes through them in cranky, splintered tangles. It is a scene of aching beauty. All these years later, the fallout of sediment here, reportedly off-scale and breaking world records ten times, has refused to let the jungle grow back. Heath-like tufts cling to the tops of bald ridges like hair implants. But in the clambering over rocks and wading through fast-current streams you rarely look up. Luck sets a pace that isn't friendly to those who have spent too long behind computers, on planes and in cocktail lounges - adept at multi-tasking all three at once. He wears bright yellow flip-flops that are two narrow for his broad flat feet, purpose-built over generations for climbing. He skips across rocks, we stumble in between. TLTB glares down at its new ash-soaked Nikes. They are optimistically branded 'Lunarlon', but their capability clearly depends on who is filling the shoes. It isn't long before one of our crew has scraped his shin. Lahar is easily mistaken for a solid riverbank to climb on and we don't learn easily, falling off rocks and banks back into streams. A small thatch hut rises out of nowhere on the horizon. It is HQ for the Mount Pinatubo Security Ranger who turns out to be one of Luck's cousins. Exactly what the day-to-day activities of this job are it is hard to say, but with a still-active volcano nearby it's nice to know he's there. Luck doesn't speak English. He hears the puffers behind him, turns around, then laughs. Yeah, ok, we laugh too, in between gasps. 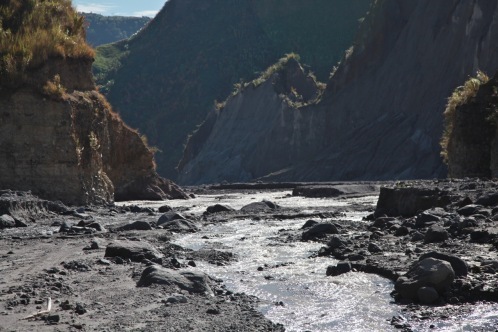 Backfilled by lahar, the climb to Mount Pinatubo isn't steep, it's just a teasingly awkward, slope. It is two hours before Luck stops to give us a breather. A couple of large open sheds with picnic tables and toilets give it an official air. We find out that until around a year ago, jeeps could drive all the way up here, leaving a mere half hour climb to the summit of Pinatubo. Even today, the lahar is still shifting the parameters. The crater looks like a large luminescent lake you want to dive into. And you can, unofficially, only someone has forgotten to tell us. We climb on. A purpose-built pathway makes up for the steep incline, but the final stairs to the top all but break TLTB. A near-wimpering mess, TLTB has to be fed and watered before it can contemplate the majesty of a rain-filled crater (note to self: always eat breakfast). After the rawness and rigours of the past 2.5 hours climb, it is a little dispiriting to see how prettily landscaped the area around Mount Pinatubo's crater is. Complete with picnic areas and a cutely carved wooden sign all that seems missing is Yogi bear. The crater looks like a large luminescent lake you want to dive into. And you can, unofficially, only someone has forgotten to tell us. (Let's make that a second note: bring bathers). TLTB contemplated walking down (and then back up) the gazillion stairs that lead down the steep descent to the waters edge.. Yes, TLTB contemplated and contemplated for....five seconds.....and caved (sorry team). TLTB is, however, happy to report back from other crew members that it is like swimming in a nice warm bath (having cooled over time from 500 degrees Celsius, 932 F, to around 26 degrees Celsius, 80 F) even if it does feel a little weird when the bank suddenly drops away into a large nothingness. TLTB is thinking how nice it might be to chopper back out of here when we pass by a large wooden cross that has been erected above the crater in memorial to what went on here. It is a timely reminder to get over one's tiny burdens. TLTB has new resolve and can report that, while not necessarily easier, it is quicker going back downhill. We are back in the jeep skidding along the final plains. In the distance, you can glimpse the outlines of an Aeta woman and three small children picking amid the ash. We learn that they make their living from collecting volcanic pumice stone. It is a barren scene but, for them, not godless. Engraved in a nearby bank of ash is written 'I heart Jesus' alongside a drawn cross, a painted yellow sun rises above. The jeep heaves with another great lurch up a bank. Luck just laughs.